We’ve been celebrating Earth Day on April 22 for 46 years. For the early “Soldiers of the Soil”, April meant preparing for the growing season. 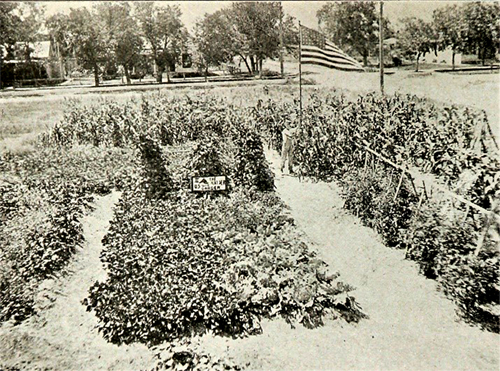 The March-April 1919 magazine had many articles about the gardens and crops grown by 4-H members. This issue also noted the meeting in March of state club leaders, assistants and some county leaders, and national leaders in Kansas City. Thirty-three northern and western states were represented. The article stated that 21,845 club projects were organized in 1918 involving 529,723 members. The value of food, feed, garment-making, handicraft and others was $6,019,092.06 produced at a cost of $2,447,313.54. They reported that 2,000,000 members were enrolled for 1919, so even larger outcomes were expected. Growing gardens and crops has certainly changed since 1919. If you have club members who are growing crops or gardens, ask them to talk about what they’re planning to grow this season. Talk about what modern changes there have been in seed and plant varieties, planting methods, tools and equipment. For a service project, your group can plan and then plant a garden. There may be a school that could have a vegetable garden as a project for students and source of fresh vegetables to serve in the cafeteria. You may find a space in your community or at your fairgrounds that would be perfect for a flower garden – try to plant some pollinator-attracting plants for bees, butterflies and other pollinators. Perhaps there’s an existing garden at a senior center or other site that could use some fixing up. Or, you might be able to do exactly like Raymond Search did; find a vacant lot that is littered with trash. You could also clean it up and plant a garden to help feed those less fortunate than your group. These would be great projects for Earth Day, too! This entry was posted in History and tagged Clean-Ups, Earth Day, Gardens by Larry Krug. Bookmark the permalink.